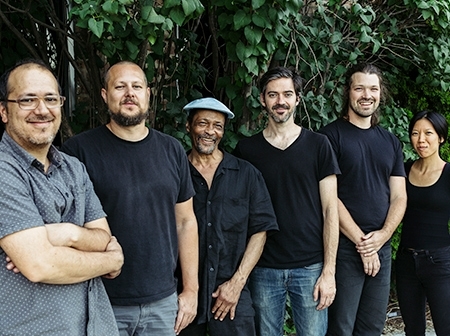 Led by composer and bassist Christopher Dammann, Restroy is a frisson of transformation that dives into the intersection of improvised and contemporary American music. Restroy connects, dissects and evolves musical traditions to find a shared tongue, forge space for communication and provoke metamorphosis in both participant and listener. Avreeayl Ra, drums; James Davis, trumpet + electronics; Paul Giallorenzo, synthesizers + keyboards; Mabel Kwan, piano + synthesizers; Christopher Dammann, bass and compositions; and Kevin Davis, cello + electronics. Restroy’s 2018 self-titled Cassette/CD release on 1980 Records wields patterns and textures as forms for improvisation. On each track, acoustic instruments are augmented with and juxtaposed against electronic textures and noise. The result is an exuberant, lyrical series of inflection points and layered sonic spaces anchored by the great Avreeayl Ra. The release features cover art by Aimee McDavitt. The sextet is comprised of leading musicians from diverse musical traditions: Avreeayl Ra , drums; James Davis , trumpet + electronics; Paul Giallorenzo , synthesors + keyboards; Mabel Kwan , keyboards + piano; Christopher Dammann , bass and compositions; and Kevin Davis , cello + electronics. Scott Clark will be filling in for Avreeayl for Restroy’s May 15th, performance at the Bridge PAI.